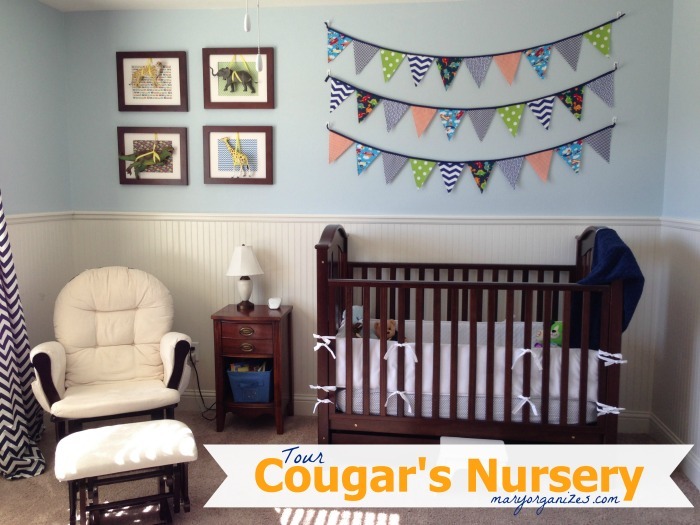 My goal was to finish Cougar’s nursery by his 1st birthday. The sweet baby didn’t even sleep in his room until he was 9 months old. I made my goal within a month, though I’m not sure I’ll ever really feel done. 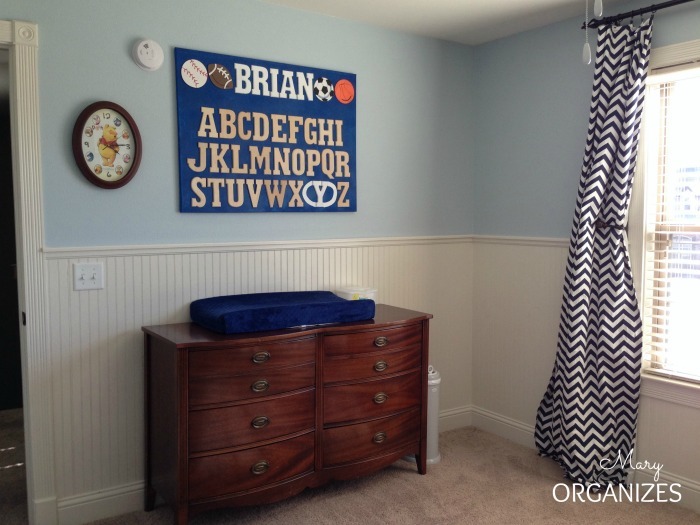 Kids rooms are always a work in progress, because our kids grow and their needs are constantly changing. My goal was to go with a baby-fun look that could grow with him. 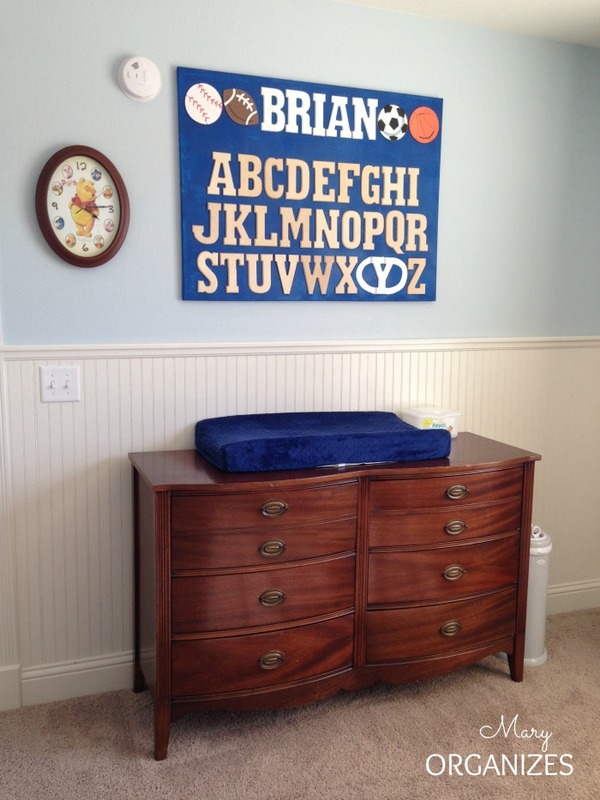 This is Brian’s changing table. I used an antique dresser that has been in the family since my grandparents. It is the perfect height for diaper changing. I use the drawers for diapers, extra wipes, blankets, and crib bedding. The whole family made this alphabet chart for Cougar’s 1st Birthday present. We took a big canvas, painted it, then glued on letters. I painted some letters white and left some plain wood. After, I sprayed it all with clear spray paint to make sure it was all set. The Winnie the Pooh clock has been in all of my baby’s nurseries. This is my favorite corner. I get my best snuggling done right there. I keep his books handy in the bin in the night table. 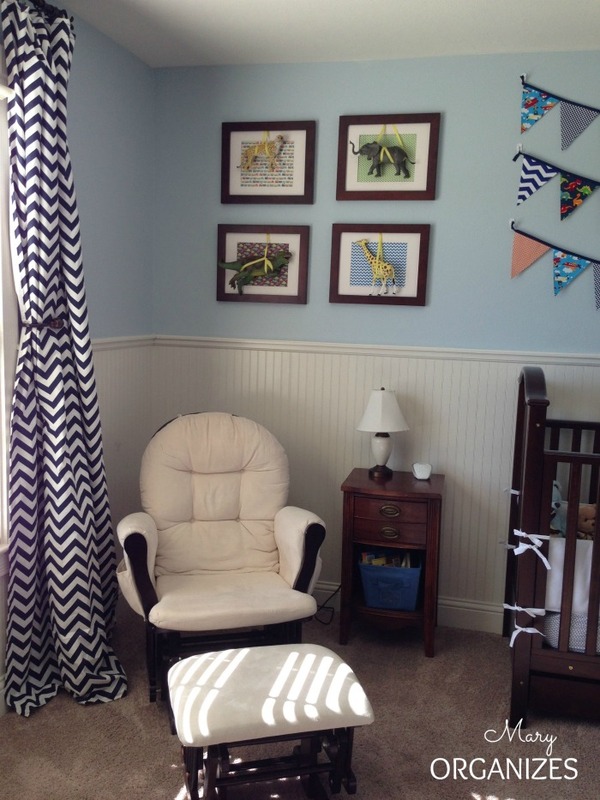 I really enjoyed creating the artwork for his room. I sewed the pendant banner and made his animal artwork. Decorating crafts are my favorite kind. The step stool in front of the crib is because I am so short! It helps me reach to set him gently in his crib. Here is the closet. I keep the doors closed. 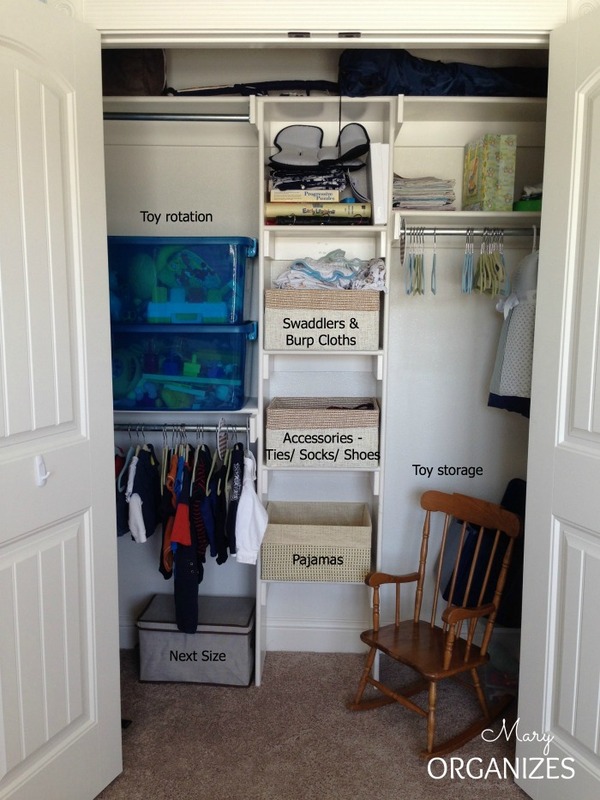 I probably won’t see it on Pinterest, but it stores all of Cougar’s things in an organized way. 🙂 I labelled the photo so you could see where I store things. 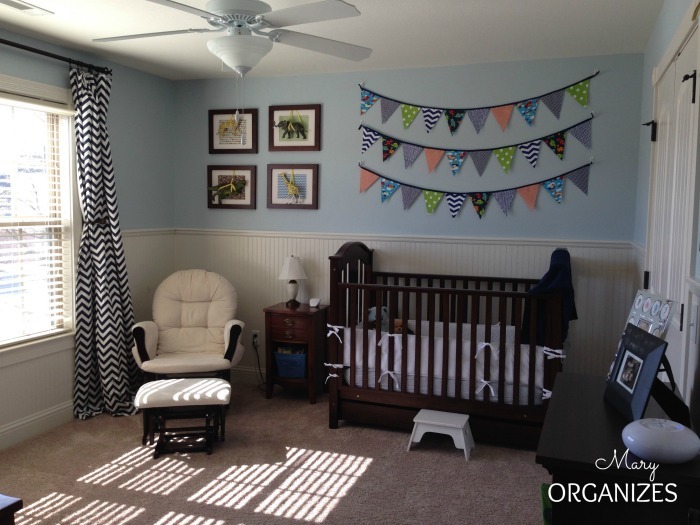 Jungle Art – Nursery Decor comes alive! I hope you enjoyed a little glimpse into my home!! Stay tuned … my girls rooms are coming soon! Don't forget your Declutter Printable Pack - it's more than just checklists! it looks great. I love it. 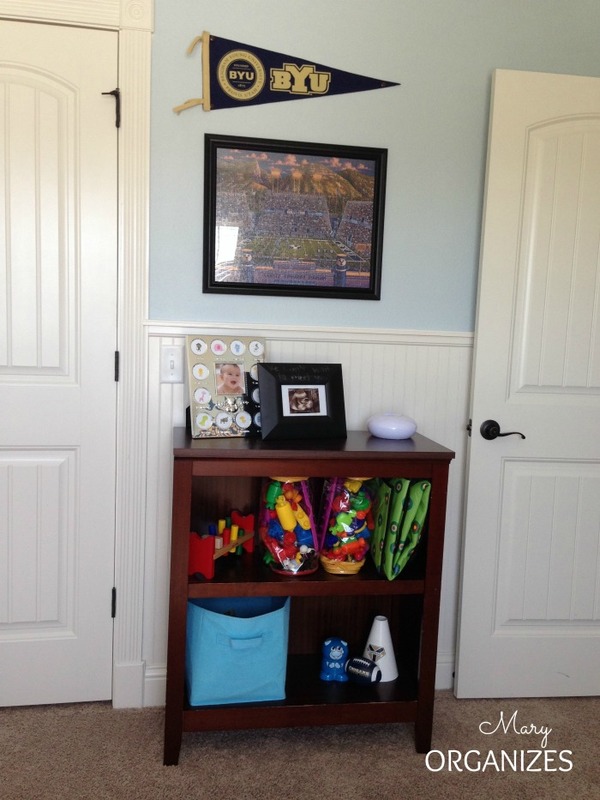 It’s absolutely perfect, neat, smartly organized with just the right amount of personal decorative touches. My favorite part of the post, though, was that stool you use to set Cougar down gently. Soooooo cute.